Heaven’s gates are open wide! Early morning phantom in the woods. I woke up just before dawn and got up to take the dogs out. The 6:00 a.m. air was frosty and clear this morning, the woods very still and silent. Suddenly a man’s voice began to speak in the woods just off the driveway, causing me to startle and sending the dogs into paroxysms of howling; luckily I had leashed them so as to avoid an early morning deer-chase, or they would have lunged into the dark woods in search of the intruder. A liberal scold reads to children and makes them sad. I am a big proponent of literature-based language intervention for children with language-learning disabilities. I’ll often choose a text and have kids study it for several weeks, using the text for semantic development, syntax practice, and narrative retelling. This past weekend we cut down a bunch of enormous invasive shrubs on part of our property. I decided I wanted to plant some sugar maples in their place, with dreams of homemade maple syrup dancing in my head (despite last year’s sad attempt at making syrup after tapping one lonely tree). I looked on Stark Brothers and on the sites of several other large nurseries I’ve ordered from, and 3-4′ trees run around $18 a piece. I decided I could afford four of them. Social Justice Warriors, small towns, and Trump rallies…let’s talk about my poultry instead. 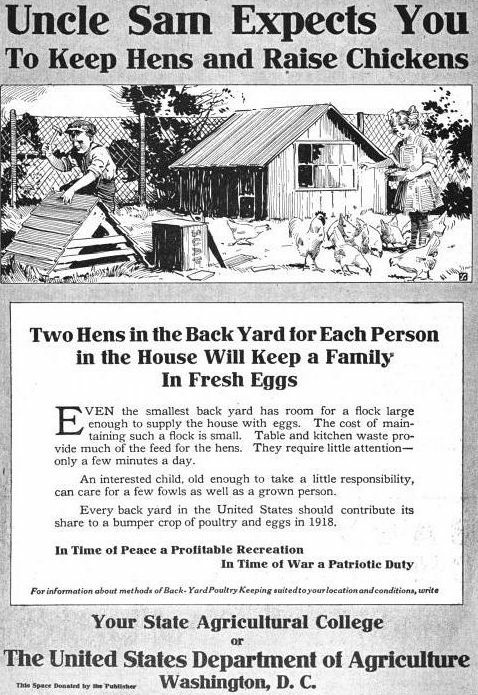 USDA propaganda then and now. Women can be hard-working and innovative in their proper sphere. I read a comment from a man recently on a blog that asserted, possibly somewhat tongue-in-cheek, that the goal of most women is to never work a day in their lives. All joking aside, while it is no doubt possible to find real life examples of such women, I would assert this is not generally true.